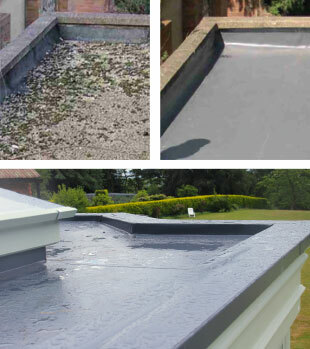 Often referred to as rubber roofs, the membranes used by Roof Technology to protect your home have been designed to perform in the most extreme weather conditions. Furthermore these abilities have been independently assessed by the BBA to last 40 years and more. The waterproofing properties of a traditional felt roof are effected by sunlight and movement caused by changes in temperature. The membranes we use are unaffected by ozone and UV light and do not suffer problems of expansion and contraction caused by changes in temperature. Their properties allow them to stretch but not tear, split or crack and they will not be host to plant or bacterial growth. In addition to the membrane a range of metal details and trims are combined to finish any roofing requirement soundly and smartly with laps and perimeters that will not deteriorate. There are differences in the design and materials of the leading products installed by Roof Technology so read here what Sarnafil, Ruvitex Rubberbond EPDM have to offer. Be sure when planning a new or refurbished flat roofing project not overlook the benefits of roof insulation. Building Regulations require you to improve the thermal efficiency of your roof.